Please note if you have some old Blueroom Minipods manufactured by B&W, as far as we are aware these “Podspeakers” Drive units will not work. We have been informed by B&W that they can no longer supply drive units for Blueroom speakers. This spare MiniPod Tweeter is compatible with Minipod MkIV (inc. Minipod Bluetooth Mk III), Bigpod MkIII and Drop MkIII. If you wish to replace a tweeter in an older Scandyna model (e.g.. Minipod Mk I – III or Drop Mk I – II ) then you must replace both tweeters as a matched pair. Please note NOT compatible with Bigpod MkI or Mk II ! 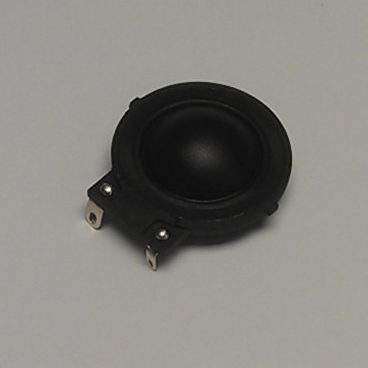 To get access to the minipod tweeter, you first have to remove the trim-ring from the woofer, then remove the woofer by undoing the four retaining screws. You can then reach inside the unit and remove the tweeter (by a twist ~1/8th turn counter clockwise), withdrawing it into the speaker and out of the woofer hole. Please make a note of which terminal the wires connect to before pulling off the spade terminals. please do not pull off holding the wires or you may rip the wire out of the spade terminal ! Hold the spade directly and pull off (you may need to use long nose pliers).